Amino Acids for Super Humans, Part IV - Purported Ergogenics (1/3): Beta Alanine, The New Creatine? Beta alanine, unlike l-alanine is one of the "beta-amino acids", indicating that it is neither essential nor proteinogenic, i.e. it is not built into proteins or used in the synthesis of major enzymes. Nevertheless, beta alanine plays a major role with regard to health in general and brain health and muscular performance, particular. Taken orally, as a supplement, beta alanine (BA) has a slight sweet taste to it (the artificial sweetener suosan is derived from BA). It is highly water soluble and the funny tingles, which can be avoided by either taking it with food or by taking smaller servings (e.g. 5x 800mg for a total of 4g, which would be a reasonable amount for carnosine "loading") multiple times a day, aside, it is virtually side effects free (some people also develop benign allergic skin or mucosal reactions and/or diarrhea). are dietary sources of beta alanine. All three are particularly high in meat, eggs, dairy, which is why vegetarians tend to have significantly lower beta alanine intakes. With beta alanine being a non-essential amino acid, low intakes of beta alanine would not be a problem, if it were not the rate limiting substrate in muscular (and cerebral) carnosine synthesis. Note: This is the detailed transcript of my show notes to "Amino Acids for Super Humans Part IV"
In that, it is important to note that the immediate effects, many fitness enthusiasts report on the health and body building boards on the Internet, are probably placebo and/or psychological effects related to the tingling sensation, most people get from beta alanine intakes in the range of 1g+. Muscle carnosine levels rise gradually, a sensible supplementation regimen would thus span 4-6 weeks with a daily intake of 3-5g of beta alanine per day - preferably in divided doses to avoid the tingling and ensure proper absorption. Studies show that after a certain time-frame, which varies according to interpersonal differences and training modalities, carnosine levels saturate. Whether or to which extent continuous supplementation makes sense in these circumstances has not yet been elucidated and would certainly depend on the individual athletic demands. Regardless of whether they enjoy or hate the tingling sensation that comes with higher doses of beta alanine, neither the "lovers" nor the "haters" can provide a 100% scientifically proven explanation for their occurrence. A common theory relates to the process of carnosine synthesis, of which you have already learned that it involves two amino acids: beta alanine and l-histidine. The latter is abundant in muscle tissue and the generally accepted hypothesis is that it is released in the presence of beta alanine in order to form carnosine. If a sudden spike in serum beta alanine levels occurs, the amount of histidine that is released from the muscle tissue could either surpass the amount of beta alanine that is actually there to recombine to carnosine, which would subsequently be stored within the muscle (or other tissue), or there is simply not enough carnosine synthetase (the enzyme which catalyzes the reaction of beta alanine + l-histidine to carnosine) available. In both instances there would be a net increase in "free floating" l-histidine in the blood stream, which in turn could undergo decarboxylase by the respective enzyme, L-histidine decarboxylase. The histamine produced in this reaction could then activate histamine receptors at the tissue level and provoke an "allergic" reaction that feels like a tingling sensation. Both, the non-occurrence of the tingling as well as the few reported instances, where the latter are accompanied by a rash on the tingling body parts, would support the histamine-hypothesis. In Joe Antonio's Performance Nutrition Podcast, back in 2006, however, Jeffrey R. Stout suggested another possible mechanism (PerfNut. June, 2006). According to Stout, a direct interaction of the beta-alanine molecules with neurons in the respective tissue would be responsible for the (un-? )comfortable sensation. And, to make things even more complicated, I would like to suggest a third hypothesis: Those of you who have had thequestionable experience of (over-)consuming GABA orally, may have noticed that, the shortness of breath aside, the activation of peripheral GABA receptors can provoke a feeling which is not all too different from the BA-tingles. With beta alanine being a GABA-A & GABA-C agonist, this would be another, yet possibly the least likely, explanation. Beta Alanine & Taurine - archenemies or synergists? Whatever the reasons for the tingles are, they are just as benign as oral beta alanine supplementation in general. In this respect, any possible concerns, my report on the hypoxic consequences of beta alanine induced taurine depletion in isolated cardiomyocytes might have brought up, would be inappropriate. Other than cells in a petri dish, your heart, or rather your whole body can very well take counter-measures against overtly high beta alanine levels and consequent cellular taurine depletion. The latter could at worst become an issue, if you decided do lace all your foods, drinking water and whatever else you consume with tons of beta alanine for weeks to deliberately deplete your taurine stores. In the aforementioned study the scientists found that "buffering" (remember these experiments were done in a petri dish) the beta alanine with equal amounts of taurine, i.e. one taurine molecule for each beta-alanine molecule. If you wanted to mimic this equilibrium state in your supplemental regimen, the higher molecular weight of taurine (125.15 g mol−1), as opposed to beta alanine (89.09 g mol−1), would dictate a ratio of about 3:5. A reasonable way of achieving this could be 1.5g of beta alanine upon waking, 1.5g before workout, 2.5g taurine post-workout and another 2.5g before bed. Personally, I do not think that supplementary taurine intake would be necessary (assuming you keep your beta alanine intake in the suggested range of 3-6g per day), but since both amino acids appear to have ergogenic potential (and taurine is also involved in many other metabolic processes) it may make sense to supplement both, anyway. Whether would be necessary or even beneficial to take them one at a time in order to avoid competitive absorption is yet questionable. Under the assumption that the ratio is not totally off - like 15g of bet alanine and 500mg of taurine - I assume that you will absorb reasonable amounts of both, even when you take them together. Beta alanine, does it have endocrine effects as well? Aside from the neurological effects of beta alanine (Tiedje. 2010) there is yet another hitherto hardly recognized effect of 3-Aminopropanoic acid (BA) in mammals: Beta alanine appears to modulate estrogen metabolism. A 2010 study by Yang et al. (Yang. 2010) found that beta alanine significantly (-18%) decreased estradiol levels in adult rats. This is an interesting observation, especially if one takes into account the results of Walter et al. (Walter. 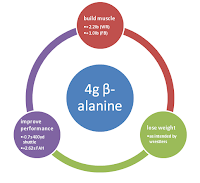 2010) who recorded a significant weight gain in 44 women supplemented with 1.5g of beta alanine for 8 weeks. In contrast to other studies on male subjects, the weight gain was not due to superior increases in lean mass (measured, unfortunately, by air displacement instead of DEXA), as the latter increased similarly in the control group. Note: The study by Yang et al. does not conflict with existing human data from Hoffman 2006 and Hoffman. 2008, who found no increase in testosterone, growth hormone or cortisol response to exercise in football players and experienced resistance trainers after 10, respectively 4 weeks of beta alanine supplementation. Those endocrine parameters remained unchanged in the Yang study, as well. It is common knowledge that the reduced estrogen production at the onset of menopause is partly responsible for the weight gain women experience at that age. That the opposite, i.e. 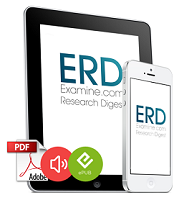 weight loss, and more specifically, fat loss, is a consequence of lower estradiol levels in men is yet less well known. And despite the fact that this hypothesis warrants experimental verification, it may be possible that small, yet statistically significant endocrine modulations due to beta alanine supplementation may in part explain both, the weight gain the women in the Walter study experienced (Walter. 2010), as well as the improvements in fat loss and retention of lean mass in dieting wrestlers in the recently published study by Kern et al. (Kern. 2011). Bottom line: Although beta alanine is the next "big thing" since protein and creatine supplements, it probably is a way smaller "big thing". If you got to chose and are no athlete competing in weight classes, creatine will probably provide greater benefits in view of performance increases and body recomposition or muscle building. If you can afford taking both, however, do not hesitate! Studies like Hoffman 2006 make it quite clear that the combination of creatine and beta alanine, which work via distinct mechanisms of action, is the way to go for the non-drug taking athlete who is looking for the slight edge which so often decides on victory or defeat.